The Apple Watch isn't just for consumers. Apple showed us at its Spring Forward keynote that consumer-centric apps like Uber could allow business customers to order a ride quickly and the SPG app will help fast-paced business travelers ditch the check-in line at a hotel and use the smartwatch as a room key. The other part of the equation is enterprise-specific apps that will help businesses reach sales goals. Partnering with Salesforce, Apple VP of Technology Kevin Lynch showed off the Salesforce apps on the Apple Watch. Salesforce designed its apps for the wrist to offer users access to glanceable information and the ability to be notified when a major event occurs. Unlike the tablet, phone or desktop, the Apple Watch is built for quick interactions. While you may use your computer for hours at a time and your phone for minutes on hand, Salesforce VP of Solutions and Product Marketing Michael Peachey told TechCrunch the Apple Watch is designed to be used for seconds at a time. Peachey said Salesforce's enterprise apps account for this different usage behavior. The company had launched a Wearables SDK last summer and is releasing new apps to work on Apple Watch. Salesforce has launched the Salesforce Wave and Salesforce1 apps for Apple Watch along with a new SDK for partners to create their own apps. In designing Salesforce Wave, Peachey said his company wants to give users quick access to information. Wave isn't about detailed analysis; instead it's about giving users snapshots of key information when they need it. If users want more details, then they can pull out a phone or tablet, or head back to the office PC to dive in. The Salesforce1 app is the second component to the solution that Salesforce is providing. Whereas Salesforce Wave is about access to information, Salesforce 1 is centered around giving wearable wearers alerts, including notifications for when deals are made or when marketing goals are achieved. Finally, Salesforce Wear is Salesforce's SDK that allows customers to create their own Watch apps with information from the Salesforce platform. 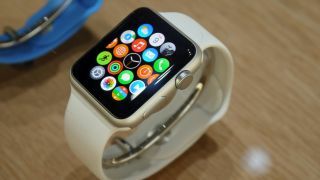 For enterprise IT administrators, wearables like the Apple Watch represent a new screen size and computing paradigm to work with. Beyond the cloud, mobile and social, Apple Watch is about receiving updates and deciding what happens next. "It's not about delivering more and more notifications," Peachey said. "Industry and people will realize, the personal and instant way you get updated on something IS important. You just get nudged, see just a snippet at the time and take action."